Set in rural Maine during the height of the Cold War (1957, to be precise), the film focuses on a young boy named Hogarth (voiced by Eli Marienthal). He lives at home with his single mom, Annie (voiced by Jennifer Aniston), and spends his days reading comic books and watching old sci-fi and horror flicks on TV. He has an exuberant imagination, and he often brings home small animals such as squirrels to be pets (much to his mother’s chagrin). Hogarth’s life changes when he uncovers a massive path of destruction in the nearby woods. He traces the source to a giant robot who has become entangled in the power cables of an electrical substation. Hogarth manages to find a way to shut off the power — conveniently in the form of an on/off switch at the side of the building — and in the process gets himself a mechanical new friend. There’s one problem: the government has arrived in town. Specifically, U.S. agent Kent Mansley (voiced by Christopher McDonald), from the Bureau of Unexplained Phenomena, is sent to investigate the destroyed substation. 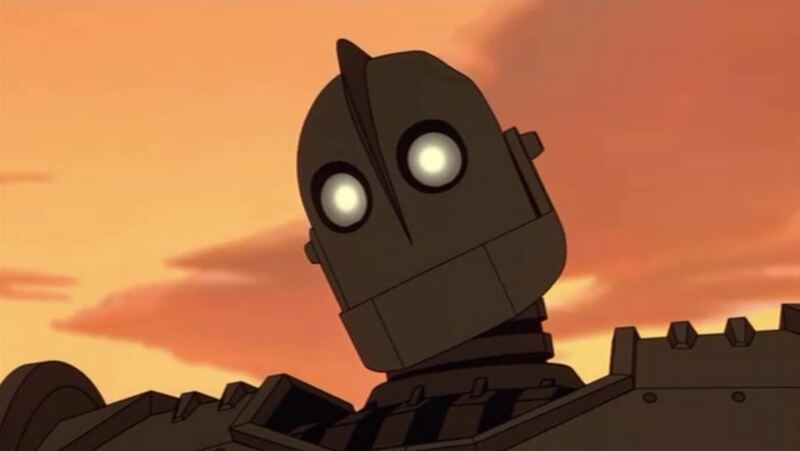 He soon realizes that there is, in fact, an Iron Giant in the area, and he makes it his goal to dismantle the robot, citing possible Communism as his main reason. Hogarth, with the help of a friendly neighborhood beatnik named Dean McCoppin (voiced by Harry Connick, Jr.), tries to hide the Giant from the increasingly-paranoid government. Not an easy feat, considering the Giant is taller than most trees. Fear and paranoia are underlying themes throughout the entire film. While many of the town’s citizens are afraid of this mysterious new robot, most are already living in fright due to the Red Scare of the ’50s. The presence of a delusional government agent only exacerbates their concerns. Yet at the film’s core is a positive message. Hogarth, though he plays with toy guns and dreams of being an American soldier, knows that violence is not the answer. Hogarth understands the Giant and knows that he means no harm, but Mansley is so trigger happy that he is ready to drop a nuke on the entire town without hesitation. The film has a strong anti-war and anti-guns message, but it never hits the point of being overly preachy. The Iron Giant was a box office flop in 1999, earning just $31 million of its $50-70 million budget, though it has fared better since hitting the home video market. It is perhaps the last great American hand-drawn animated film, and it is one that can be enjoyed by people of all ages. There are no musical interludes, no talking animals, no princes or princesses. This is just a great film with a strong story, and it is far more thought-provoking than most of its Disney rivals. I think you need to get over your disdain for Pixar because Pixar is not Disney. Their stories are always better and more realistic than anything Disney has done since “Beauty and the Beast.” Pixar was Steve Jobs’ baby during one of the time periods he was kicked out of Apple and he pushed those guys to create something really special.While I realize that the head of Pixar is now the head of Disney Animation, this move can only bring a higher quality of story and plot to Disney films. Remember “The Incredibles?” That was a Pixar project directed by Brad Bird. That movie is simply not a great animated movie, it is a great movie. Period. As far as I am concerned Brad Bird is the real deal and I will watch his movies to see where he takes it time and time again. Pixar films are hit or miss for me. There are a few I really like, namely the Toy Story trilogy and Wall-E, but most of the rest didn’t leave a significant impression on me (i.e. Finding Nemo, Monsters Inc, Up, Brave). I know I am in the huge minority on that, especially with Up which it seems everyone loves, but everyone has different tastes, you know? Generally speaking, I think I just prefer the more mature themes found in Studio Ghibli films, not to mention their gorgeous hand-drawn animation style. Admittedly, I haven’t seen all of The Incredibles, but considering my love of The Iron Giant, I will make it a point to check it out sometime soon. Having spent time as a movie reviewer and being a Mom forced to watch animation of the last 15 year, I agree that Studio Ghibli is the best. But is part of that because they are exploring Japanese folktales that Americans are not familiar with and, therefore, we find new and exciting. I love Pixar for their storylines. They are all, essentially, buddy movies. But I like where they go and that not all of these people are black-and-white good or bad people. That’s a great point about Studio Ghibli. I think it definitely helps that it tackles subjects we are not familiar with. That could be why I’m so jaded with most American animated films — many are just rehashes of the same basic storyline (moreso Disney than Pixar). I did like this movie quite a bit, as well as the book that it was based on when I was a kid. 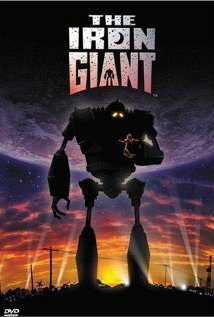 Interesting to note; Pete Townsend (from The Who) co-produced this film, as well as made a rock opera based off of the book 11 years before Iron Giant was made. I didn’t know about Townsend’s rock opera. That’s really cool. Yeah, it came out in 1989. I’m not one hundred percent sure, but I think it kind of went unnoticed at the time. Thanks! I’m glad I finally gave it a shot. ^ THIS. I don’t inherently dislike any of the recent Disney/Pixar films, but so many of them just seem to follow the same predictable formula. I know I’m not their targeted demographic, but sometimes it seems a little more effort would go a long way. Glad to hear you are a big fan of The Iron Giant as well. It’s definitely high up on my list of animated films now. Iron Giant is a big favourite of mine. I grew up reading the book by Ted Hughes and the film did the book great justice. Glad to hear you enjoyed this one so much! Especially considering you;re not a massive fan of animated films. 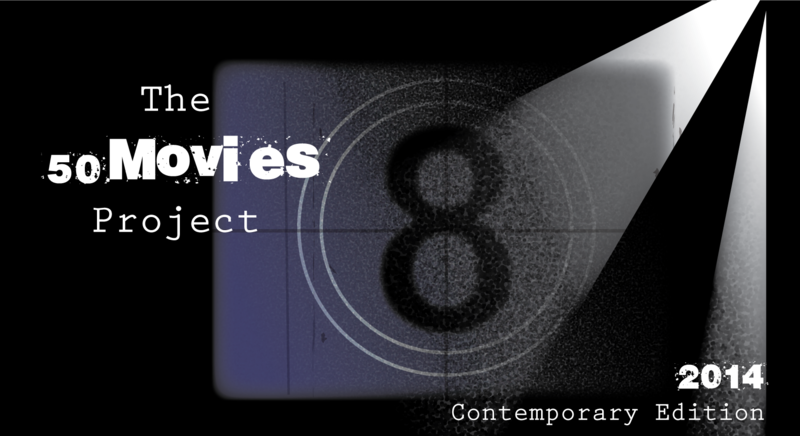 Have you checked out some of Studio Ghibli’s earlier films? I have seen a few of Studio Ghibli’s 80s films — Grave of the Fireflies, My Neighbor Totoro and Kiki’s Delivery Service, all of which I love (especially the first two). I still need to see Castle in the Sky, however. Along with Fireflies, my all time favourite is Princess Mononke. (Think that’s the right spelling!) It is a fantastic film. Maybe a bit overly long, but blew me away. Give that one a shot. Princess Mononoke was actually the first Ghibli film I saw, but it was so long ago that I don’t remember it too well. I should really give it another watch soon. Do. It’s worth it. I’m not a huge fan of the newer Ghibli films to be honest with you. Catching up with some of hte older ones. Oh, I agree. I haven’t actively disliked any of their newer films (except for maybe Tales from Earthsea) but the last few have been a major step down from their earlier work.